This article is about the Illinois city in Saline County. For the Illinois township in McDonough County, see Eldorado Township, McDonough County, Illinois. According to the 1945 Film Daily Yearbook, the 500-seat Grand was one of three movie houses in operation at that time, which also included the Orpheum and the Knox. Today the former Grand is used as a meeting place for a fraternal order. Location of Eldorado in Saline County, Illinois. Eldorado (/ˌɛldəˈreɪdoʊ, -də/) is a city in Saline County, Illinois, United States. The population was 4,122 at the 2010 census, with a 1925 peak of 8,000. Although the city's name is spelled as if it were Spanish, the name was originally "Elder-Reado"—a combination of the last names of the town's two founders, Judge Samuel Elder and Joseph Read. According to legend, a signpainter for the railroad painted the name "Eldorado" on the train depot; as a result, the spelling and pronunciation was forever changed. Eldorado is included in the Illinois–Indiana–Kentucky tri-state area and is a bedroom community in the Harrisburg micropolitan statistical area. In September, 1963, five months before The Beatles' first appearance on The Ed Sullivan Show brought them stardom in the United States, George Harrison performed at the Veterans of Foreign Wars hall in Eldorado with a local band called The Four Vests. This was the first performance by a Beatle in the United States. At the time, Harrison and his brother were visiting their sister, Louise, who had recently relocated with her husband to nearby Benton. At one time there was an extensive maze of railroad tracks that arched out from the town's center. All but one are now replaced with bike trails. In 1946, the adjacent village of Beulah Heights disincorporated and annexed to Eldorado. Eldorado was a sundown town until the sign was removed in the 1960s. Eldorado is located at 37°48′51″N 88°26′27″W﻿ / ﻿37.81417°N 88.44083°W﻿ / 37.81417; -88.44083 (37.814212, -88.440937). According to the 2010 census, Eldorado has a total area of 2.431 square miles (6.30 km2), of which 2.39 square miles (6.19 km2) (or 98.31%) is land and 0.041 square miles (0.11 km2) (or 1.69%) is water. The junction of the pioneer Kaskaskia and Goshen Trails was located just south of the city. The Goshen Trail began in Old Shawneetown, Illinois and ran along the east side of Eldorado and on to the Goshen Settlement, a community near the present day East St. Louis. As of the census of 2000, there were 4,534 people, 1,945 households, and 1,182 families residing in the city. The population density was 1,967.8 people per square mile (761.1/km²). There were 2,236 housing units at an average density of 970.5/sq mi (375.4/km²). The racial makeup of the city was 98.26% White, 0.35% African American, 0.22% Native American, 0.02% Asian, 0.02% Pacific Islander, 0.22% from other races, and 0.90% from two or more races. Hispanic or Latino of any race were 1.19% of the population. There were 1,945 households out of which 27.8% had children under the age of 18 living with them, 45.8% were married couples living together, 11.6% had a female householder with no husband present, and 39.2% were non-families. 35.8% of all households were made up of individuals and 20.5% had someone living alone who was 65 years of age or older. The average household size was 2.21 and the average family size was 2.86. In the city, the population was spread out with 22.2% under the age of 18, 8.1% from 18 to 24, 23.5% from 25 to 44, 21.9% from 45 to 64, and 24.3% who were 65 years of age or older. The median age was 42 years. For every 100 females, there were 84.7 males. For every 100 females age 18 and over, there were 79.0 males. The median income for a household in the city was $22,500, and the median income for a family was $30,861. Males had a median income of $27,721 versus $14,514 for females. The per capita income for the city was $12,980. About 16.4% of families and 23.1% of the population were below the poverty line, including 32.1% of those under age 18 and 19.1% of those age 65 or over. Eldorado used to have the smallest daily newspaper in Illinois until recently when declining circulation and advertising revenue for the Daily Journal forced its parent company to scale back publication to only three days per week. The Journal had been a daily paper since 1911. In 1925, Dr. J.V. Ferrell founded Ferrell Hospital, which exists today as a 52-bed facility operated by Southern Illinois Healthcare. Effective March 1, 2004, SIH entered into an agreement with Alliant Management Services to return the hospital to local ownership and governance. On April 1, 2005, Ferrell Hospital Community Foundation became a stand-alone facility managed by Alliant Management Services. As Ferrell is a small hospital, services are routinely provided via other hospitals by transportation via ambulance for non-critical issues, and Air Evac Lifeteam Air Ambulance (for transport to Evansville, IN hospitals Deaconess, or St. Mary's) for critical emergencies. Although, Ferrell Hospital employees are very knowledgeable and can diagnose many illnesses, the facility simply lacks those provided by, for example, many Level 1 Trauma Hospitals. Eldorado holds a few records within the Illinois High School Association (IHSA). Two all-time scorers Mike Duff (2,113 points) and Cody Lane (2,006 points) grew up here, and Roger Grumley and Eric Brannock of the Illinois Basketball Coaches Association Hall of Fame were born in Eldorado. ^ "Annual Estimates of the Population of Metropolitan and Micropolitan Statistical Areas: April 1, 2000 to July 1, 2007 (CBSA-EST2007-01)". 2007 Population Estimates. United States Census Bureau, Population Division. March 27, 2008. Archived from the original (CSV) on July 9, 2010. Retrieved July 3, 2008. ^ 1951. 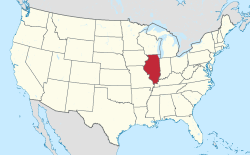 Number of Inhabitants: Illinois. Washington D.C.: U.S. Dept. of Commerce/Bureau of the Census. 13-24. This page was last edited on 18 February 2019, at 04:59 (UTC).